We were invited to participate in Startup Canada’s #StartupChat sponsored by Microsoft Canada. 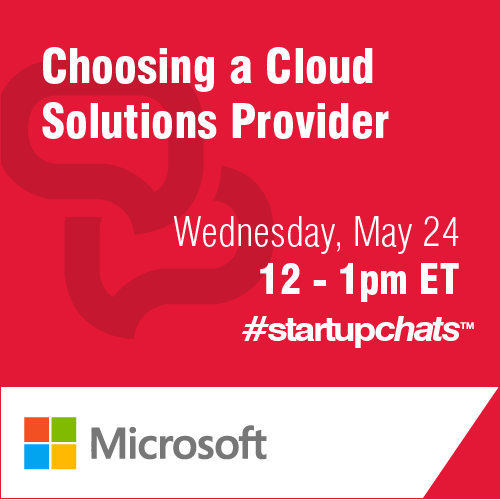 The focus of this chat was to help startups choose the right cloud solution provider. Startup Canada is a grassroots network of entrepreneurs working together to build an environment for entrepreneurship in Canada. Through online platforms, grassroots Startup Communities and cross-sector initiatives, Startup Canada is advancing entrepreneurial momentum and a culture of entrepreneurship, as the voice of Canadian entrepreneurs. A1: Ability to host your data virtually to access it from anywhere and everywhere. Low hardware cost and increase efficiency. It was an awesome opportunity to connect with Canadian entrepreneurs to share ideas and knowledge. We are excited about our partnership with Startup Canada to help build our community. You can read the entire discussion HERE.